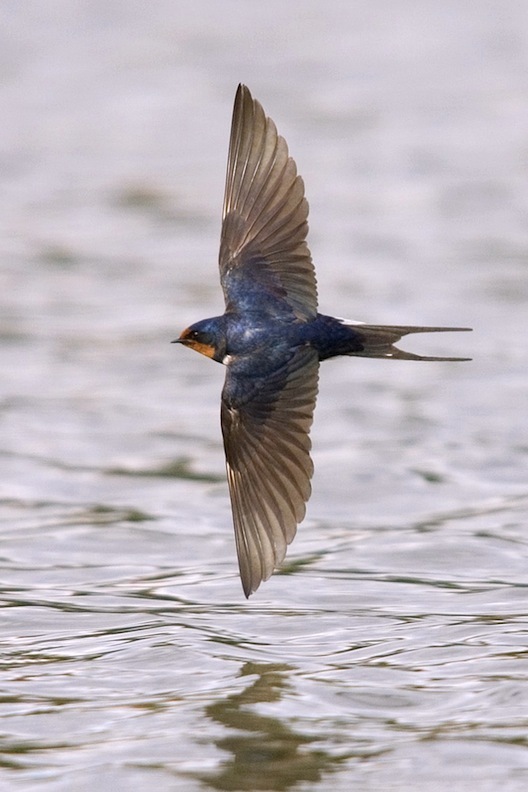 I’d watched barn swallows many times before, mostly around my family’s summer home on the St. Croix River. Each spring they’d build their mud nests under the eaves of our back porch. If we even tried going in that door, they’d fearlessly dive-bomb us, trying, I’m sure, to make us think twice about getting that close to their chicks. All those times, I guess I was too busy ducking and dodging to really appreciate these handsome birds. Years later I was standing on a dock at St. Paul’s Lake Como unloading my canoe after an afternoon of fishing. People were gathering on shore for a concert in the nearby pavilion. 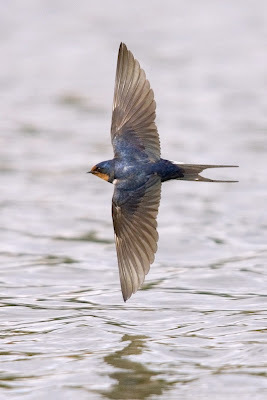 Five or six barn swallows traced broad, interwoven circles just off the end of the dock, occasionally dipping nearly to the water. What elegant creatures, I thought, remembering my previous experiences with swallows and appreciating that, this time, they seemed to be minding their own business. came barreling right at my head. I stopped and just observed the sleek, blue-black and chestnut-colored birds. How perfectly sculpted for speed and the sudden swerves necessary to catch flying insects. It was fun just watching their acrobatics, but I also was curious. Where do they live? Do they have chicks? Are they consuming their prey on the fly or taking it home to feed the family? To find the answers, I changed my focus a little. Instead of taking in the whole group’s complex, swirling dance, I decided to follow just one bird and see what it would do. Fortunately, with only a few birds in the area, this wasn't hard to do. As my subject plied the air, veering, climbing, swooping to skim the surface of the water, I wondered how many insects it tried for and missed before catching one. Suddenly, the feathered missile veered out of its orbit and came barreling right at my head. In the split second before I reflexively ducked, I spotted a large fly—or maybe it was a flying ant—hanging out of its beak. Then, just as I went down, the bird swooped and flew directly under my feet—in fact, under the dock. Wow, that’s a stunt, I thought, wheeling around to see it come out the other side. It didn’t. Ta-dah! All three questions answered: The swallow’s nest was under the dock, it had chicks and, yes, it brought insects home for them. about swallows? Tell us about your experiences! Dear Jeffry, This is just beautiful. Reading this made me once again feel how observing nature (life) makes us more intelligent people. It truly is astounding what we can learn simply through observation. In the rainforest (and in my life now) I learn so much simply be being observant. In fact, I think (for me) it is how I learn best, and I never forget it. There is something SO rewarding about learning this way. I bet you will NEVER forget what you learned about swallows, and I bet it made to hungry to learn more about the world around you. Learning this was is akin to being imprinted. It goes beyond retaining something with our thoughts or "the mind". Somehow we merge with the object of our observation, and there is a great sense of excitement, pride, and wonder because we learned something without anyone telling us. We learned it simply by watching the world. Your blog, insights, and spirit just shine on these pages here. Thanks Robin for your very thoughtful comment! Yes, the things we learn by being fully in the moment are a real gift. I like to say it's a deal we make with the soul of creation: for each layer of our perceptual, emotional and spiritual inattentiveness we shed, Nature in return sheds one layer of her mystery. I know you understand this, and it feels so good to know we're both working to get the word out to the world!